Trail to 50k: RACE WEEK! For those racing StumpJump, it’s finally RACE WEEK!! And we’re checking in with Tom Cirillo about his training, tapering, and pre-race strategies and nerves! NRC: How has tapering been, and what has that looked like for you? TOM: I did my last long, long trail run (six laps of red – had the esteemed company of Sean Patrick O’Brien for one lap a week before he took on the Barkley Fall Classic) in Percy three weeks ago, got rained on a little, which might prove to have been a good dress rehearsal for this weekend. I usually don’t like to do too much of a taper because I feel like I’m losing momentum, so I got in some longish runs the week of September 10th but also took a day completely off from running. That Saturday I got talked into (thanks Cody Case and Megan Scheumann) going to Bearwaller Gap for a “practice run” on the Defeated Creek course – I was kinda feeling like, let me get StumpJump over before thinking about the NRC race in October – but in retrospect it was a good tune-up for the 50K. Similar terrain and climbs but packed into a more manageable amount of miles. The next day I ran out at Percy with Taylor Jamieson on both road (11.2) and trail (red). We made the conscious effort to keep things at a slower pace than normal, not that I could have gone any faster post-Defeated, and it was just one of those days where the air felt slushy and the going was slow. Over the summer I signed up for the Hendersonville Half Marathon on September 22nd. At the time, this date was two weeks before StumpJump, but the race was moved up a week because there is a managed deer hunt in Prentice Cooper State forest on October 6th – I think it would be more interesting to have the runners and hunters out there together, what could go wrong? Anyway, I was still going to do the half. I took it real easy during the week and left it a game time decision whether I would race the half or use it as a long but easy pace run. I figured running 13.1 hard wouldn’t kill me for StumpJump, and it would be good to see how I felt running on decent rest and then try to replicate that feeling the following week. So I ran it hard and managed a PR by about five minutes – huge confidence builder for the 50K. 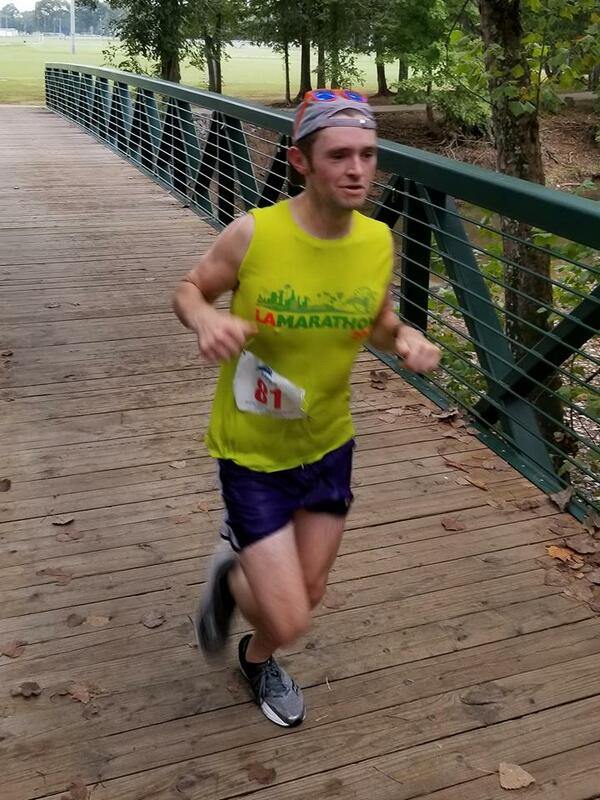 The Hendersonville Half, only in its third year, is a superb race – very flat course, some on a greenway through Drake’s Creek Park and some on road that goes by an inlet of the Cumberland River – très scenic. Organizers had the post-race snacks down – Jimmy John’s, Shipley’s Donuts, and a free beer for runners. Previously unbeknownst to me there were a lot of Nashville running group friends doing the race and it was a fun morning. All this said, I know it’s important to go into StumpJump fully rested. So taking it easy this week – ran with 12south on Monday and will hit some 20 to 30 minute runs at an easy pace. I also made it a point to schedule a couple days where I try to get a little extra sleep than usual. NRC: How are you feeling going into Saturday? Nervous about anything? Especially looking forward to anything? TOM: I’m feeling good physically, and my brain is excited for the race. Of course, I’m still a little nervous about the prospect of running a 50K considering that I’ve never run that far. I’ve been reading some race reports online from previous StumpJump races – it sounds like there are some steep descents, which I tend to have a tough time with. The only other worry I have is some kind of equipment/nutrition fail, but I’ll double-knot my shoes, stuff some gels in my pack, and hope for the best. As far as things I’m looking forward to, in a weird way I’m pumped up about being out there for a long time and appreciating the effort it will take to run a consistent, strong race. NRC: What are your race goals, strategies? TOM: Ultimately the goal is to finish, but I’m going to start with the goal of a six hour finish. That’s an 11:35/mile pace, I think I can do it, but If it doesn’t look like it’s going to happen, I’m fine with that, and I’ll just enjoy the experience. I’m going to start slowly, the first five miles or so are the easiest but I’ll keep it reeled in. If I slow down on the descents, I’ll try to make it up on the climbs. I’ve asked a lot of people about how to get over some of the obstacles in an ultra and the thing I’ve heard most is “just keep moving,” so when it gets tough, which it will, I’ll remember that. So many people have given me great advice and encouragement – I’m thankful for that. I haven’t had any nutrition issues for long runs, so I’ll stick with what I know and go with skratch and water for hydration, some huma gels and picky bars, prob try to score some pickles, pretzels, and peanut butter (appreciate the alliteration!) from the aid stations because those are staples of my everyday life. NRC: Best part of training/worst part? TOM: Best part of training was over the summer when I hit a groove and was logging a bunch of miles every week on the trails. Heading out to Flagstaff for the express purpose of running tough trails was awesome and helped get me in the right mindset for the rest of training. Number one best thing was running with friends who also have a big race on the horizon. NRC RunWild group was great – best part was the Tuesday workouts, because workouts on hills or intervals are plain tough to do solo. There is a pretty light-hearted nature to that group, but lurking beneath there’s a competitive current that makes everybody do their best. Most of my long runs were with company and I gotta shout out three dudes in particular: just about every weekend from June until September, some combo of Grant England (Natchez Trace Trail Marathon, Nov. 3), Taylor Jamieson (YETI 100-miler, Sept. 28-29), and Denton Hunker (fellow StumpJumper) would hook up on Saturday or Sunday to grind out a long run on the trails. Can’t really say there’s been a worst part. Since signing up for StumpJump I haven’t lost any enthusiasm for running the race and haven’t had any injuries. Yes, many runs were long and tough, I got poison ivy/oak (?) twice from running on overgrown trails, my car smelled pretty bad post-run mornings (gotta air that thing out…), but whatever, it’s been a blast regardless of how the race goes. NRC: What are you planning to eat/drink post-race? TOM: Filtered alkaline water and farm-raised quinoa with a pinch of organic sea salt. HAHA — glad to see all the miles haven’t ceased the Cirillo wit — and that there’s a brew in it for you after that alkaline water. Thanks so much, Tom, and CRUSH IT THIS WEEKEND! !